The new 2018 BMW X1 possesses a distinct combination of features that are set to take Houston by storm. X1 incorporates startling agility, leading safety components, and the unmistakable BMW racing spirit. This sport activity vehicle has been clocked going from zero to sixty miles per hour in a dizzying 6.3 seconds. X1 includes a 2.0L 4-cylinder TwinPower turbo engine that achieves a staggering 258 lb-ft of torque. You won’t find statistics like this on most import cars. BMW of Brazos Valley is excited to offer the X1 to the people of the greater Houston area. We have seen first hand how much attention these head-turning vehicles are getting in locations around town. Come to the BMW of Brazos Valley dealership to test drive this capable vehicle for yourself. The 2018 BMW X1 has a distinguished and commanding exterior design. The X1’s sheer power is reflected in the design decisions that BMW’s engineers made. From its angular LED headlights with cornering lights, to its shapely body panel silhouette, the X1 makes an unforgettable impression. Choose from ten brilliant colors including the striking Dark Olive Metallic and Sunset Orange Metallic. The BMW X1 is a vehicle that is certainly up for any adventure. 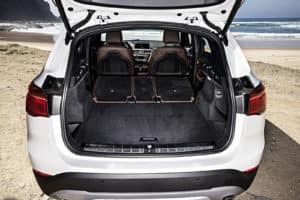 The folding 40/20/40 rear seats are useful whether you’re transporting outdoor recreational equipment or a cabin full of passengers. X1 possesses a remarkable 58.7 cubic feet of cargo room when its rear seats are declined. You’ll also discover numerous cleverly designed storage compartments throughout the cabin. BMW has also put lots of focus on its drivers comfort. From the driver’s perspective, the X1’s heads up navigation display projects directly onto the windscreen so your eyes never have to leave the road. Park Distance Control also utilizes an array of small sensors near the X1’s base carriage to help guide you into the perfect parking position. BMW keeps the options simple and refined on the 2018 X1. First, choose between the front-wheel powered sDrive28i, or the all-wheel xDrive28i. Next, the X1 has two distinctive body styles to apply. The xLine upgrade augments the X1’s bumper and rocker panels. The M Sport body style gives the X1 some racing flair. M Sport includes Shadowline exterior trim, increased aerodynamics, and high gloss roof rails. 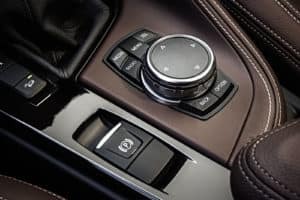 You can also upgrade your X1 to include a diverse array of driver-oriented elements like Dakota leather, collision mitigation, smartphone integration, a sport steering wheel, and more. BMW of Brazos Valley is the premier vehicle dealership for the people of College Station, Cypress, Brenham, and Centerville. 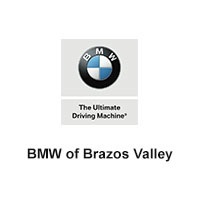 Conveniently located in Bryan, Texas, BMW of Brazos Valley’s associates have the expertise and service mindset to help you find your next new or used vehicle. Take advantage of our associates’ collective years of experience to ensure that your vehicle transaction is effortless and smooth. The 2018 X1 is a marvelous vehicle for many different kinds of people and it has a starting price of only $33,900.